This is a medical handbook with a difference. Whether you have a stubbed toe or a severe case of the blues, within these pages you'll find a cure in the form of a novel to help ease your pain. You'll also find advice on how to tackle common reading ailments - such as what to do when you feel overwhelmed by the number of books in the world, or you have a tendency to give up halfway through. 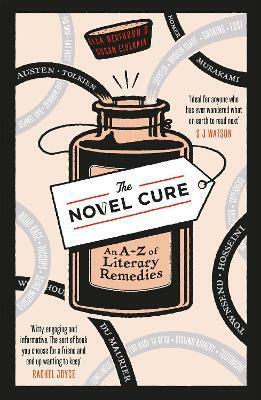 When read at the right moment, a novel can change your life and The Novel Cure is an enchanting reminder of that power. This is a medical handbook, with a difference. Whether you have a stubbed toe or a severe case of the blues, within these pages you'll find a cure in the form of a novel to help ease your pain. When read at the right moment, a novel can change your life, and THE NOVEL CURE is an enchanting reminder of that power. Ella Berthoud and Susan Elderkin met as English Literature students at Cambridge University, where they began giving novels to each other whenever one of them seemed in need of a boost. Ella went on to study fine art and become a painter and art teacher. Susan became a novelist (Sunset Over Chocolate Mountains and The Voices, both Fourth Estate) and in 2003 was listed by Granta as one of the Twenty Best of Young British Novelists. She also teaches creative writing and writes travel pieces and book reviews for various newspapers. In 2008 they set up a bibliotherapy service through The School of Life in London, and since then have been prescribing books either virtually or in person to clients all over the world. The Novel Cure is their first book together.